At 4:17 a.m. Tacoma Firefighters from stations 1,2,8,11 and 15 responded to a reported garage fire. The first arriving unit found a fully involved pick-up truck on fire with extension to the nearby detached garage and a large tree overhead. Crews initiated an aggressive fire attack to knock the blaze down and protected an adjacent garage exposure. There were no injuries to report. A fire investigator determined the cause of the fire to be intentionally set. 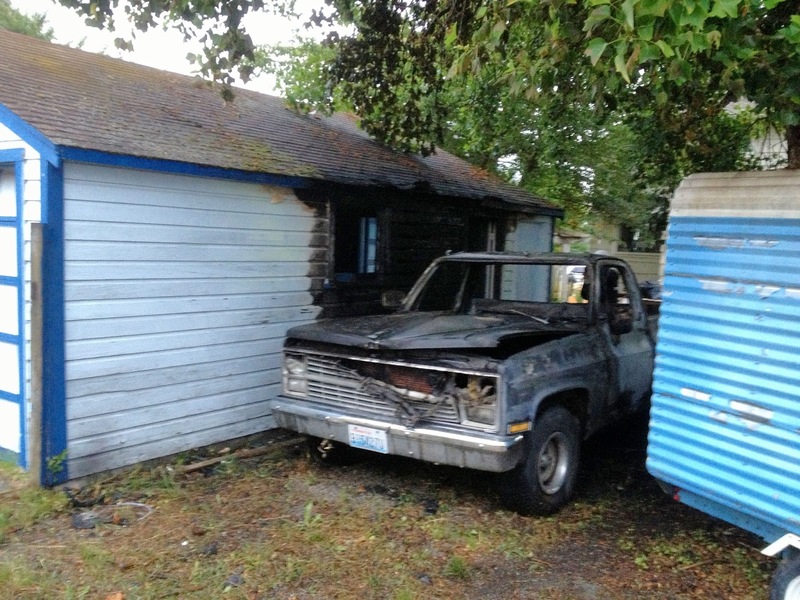 UPDATE: The fire caused an estimated $15,000 damage to the pick-up, a camper trailer and garage. At 4:42 a.m. Tacoma Firefighters from stations 1,4,7,8,9 and 10 responded to a reported vehicle and garage fire. 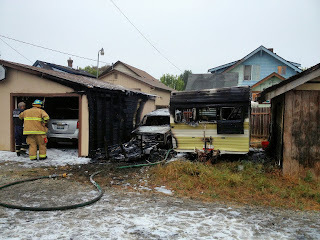 The first arriving company found a heavily involved fire in a detached garage, vehicle, trailer and recreational travel trailer. Crews attacked the fire with handlines and applied foam to help prevent the blaze from spreading to adjacent garages, recreational vehicles and a large quantity of propane stored in a backyard used to heat an outdoor swimming pool. There were no injuries to report. A fire investigator determined the cause of the fire to be intentionally set. UPDATE: The fire caused an estimated $32,500 damage to two cars, a camper trailer, utility trailer and two garages. It has yet to be determined if these two incidents are linked and the cases are being forwarded to the Tacoma Police Department for investigative follow-up. Address: 302 S. 9th St. Narrative: Firefighters responded to a report of smoke coming from a fluorescent light fixture. Firefighters used a thermal imaging camera to check the area for excess heat and found none. Address: 2916 S. 38th St. Narrative: Firefighters extinguished a small bush fire. Narrative: Firefighters responded to a reported fire in a large manufacturing facility. Upon investigation the first arriving engine company found light smoke at the ceiling level (approximately 35 feet high) and a small electrical fire in some insulation near a light fixture. Operationally, a ladder company made access to the roof and cut a small inspection hole to check for extension above the fire, while interior firefighters were able to a carefully extinguish the fire without causing water damage to the machinery below. The cause of the fire appeared to be an electrical short in a junction box. There were no injuries to report. Given the dry conditions, a Phase 1 fire safety burn ban has been instituted in Pierce County. All outdoor burning is prohibited, except for recreational fires, fires in barbecues and other cooking appliances, outdoor fireplaces and campfires in approved pits. Burning yard waste, household garbage and building materials (i.e. scrap wood, paint, vinyl flooring, roofing, and carpet) is always prohibited. WAC 173-425-050 - if the smoke from the fire bothers your neighbors, damages their property or otherwise causes a nuisance, the fire shall be extinguished. Recreational fires are not allowed during an air quality burn ban. Puget Sound Clean Air Agency (pscleanair.org) sets the regional air quality bans and local fire officials set the fire safety ban. Tacoma firefighters have responded to 148 bark, grass, brush and trees fires in July. Please do your part by observing outdoor burning regulations and properly disposing of cigarettes! Address: 8217 S. Hosmer St. Narrative: Firefighters extinguished a small grass fire. Narrative: Firefighters extinguished a 2 x 2 grass fire. Address: 3650 S. Cedar St. Address: 2202 S. Cedar St. Narrative: Firefighters responded to a smoldering bark fire. Address: 3585 E. Spokane St. Address: S. 48th St./S. Gove St. Address: S. 56th St./S. "K" St. Address: 54th Ave E/Pacific Hwy E.
Narrative: Firefighters extinguished a small bark fire. Address: S. 48th St./Yakima Ave. Address: N. 33rd St./N. Pearl St. Narrative: Firefighters extinguished a bark fire. Address: 400 S. "I" St. Narrative: Firefighters extinguished a small fire in a cardboard box. Occupants had discarded charcoal briquettes in the box and radiant heat ignited it. Address: 4117 S. "M" St. Address: 3250 S. 77th St. Narrative: Firefighters extinguished a 50 x 100 brush fire. Tacoma Police Department notified as the cause appeared suspicious. Narrative: Firefighters extinguished a smoldering bark fire that extended to a railroad tie used for landscaping and a nearby fence. Address: 6002 S. Alder St. Narrative: Firefighters extinguished a fire in a dumpster. Address: 1815 Port of Tacoma Rd. Narrative: Firefighters extinguished a fully involved motor vehicle fire associated with an accident. The car left the road, ran up an embankment, hit a fence and then burst into flames. Two patients were transported from the scene for injuries sustained in the crash. Address: 3715 S. Ainsworth Ave. Address: 6433 S. Puget Sound Ave. Narrative: Firefighters responded to a prohibited outdoor burn of yard waste. Address: S. 77th St./S. Montgomery St. 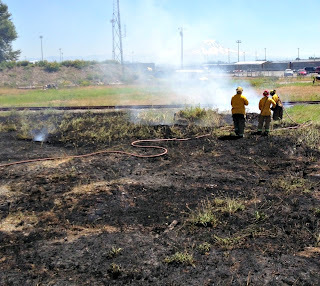 Narrative: Firefighters responded to the scene of a large grass fire the occurred the night before and wet down entire area to prevent a re-kindle. Address: 43rd St. E/70th Ave E.
Narrative: Firefighters extinguished a small fire on a cedar fence. Narrative: Firefighters responded to a reported apartment fire. Upon arrival they found a pan on the stove had burnt and caused the room to fill with smoke. Crews removed the pan, ventilated the smoke and reset the pull station and alarm system. Address: 219 S. 79th St. Narrative: Firefighters extinguished a bark fire that had extended to section of a wood fence. Narrative: Firefighters responded to a landscape hedge and fence fire. Address: 4824 Marine View Dr. Narrative: Firefighters responded to a small grass fire along the roadside.